Established in 2000, Radicchio Cafe sits on the corner of York Avenue, bordering Old City and Northern Liberty in Philadelphia, Pennsylvania. The place is small, quaint, and very unassuming. You get the feeling you are sitting in a charming cafe in the middle of Florence, Italy. When we walked in, we were immediately greeted by a few young, good-looking gentlemen who clearly didn't speak a ton of English. Lucky for them, broken English is just as good for us! Even though there were no tables available, we only waited about 5 minutes for them to grab one from the basement and set it up just where they had an open spot. Upon sitting down, we were given water, bread, and complimentary bruschetta, which, aside from the plain bread it was served on, was delicious. It contained more than just your average tomato and basil flavors - red onion, olive oil, vinegar, and a great blend of spices really gave it a boost. We ordered three appetizers. My mom opted for the Beet Salad, my dad decided on the Grilled Calamari and Squid special, and for the table, we got the served-cold Seafood Salad. They all arrived at different times -- the seafood salad came first. It consisted of calamari, shrimp, scallops, mussels, and clams and was served atop a large slice of what appeared to be red cabbage. Everything was finished with olive oil and balsamic vinegar and it was served with a lemon half. Truthfully, for the price, the appetizer was quite tiny, and if you don't squeeze the lemon over the seafood, it is rather bland. When you finish it with the lemon, the flavors of the seafood really shine, however, I just felt it could have been seasoned a bit better. However, the freshness of the seafood -- all of the components -- was perfection. The beet salad came next... red and yellow crisp beets were served with onions, goat cheese, and caramelized walnuts and dressed in a house vinaigrette. While the taste and flavors were pretty spot on, and the culmination of all the flavors worked well together, I thought the beet-to-everything else ratio was a bit off. It was almost a task to try to find a walnut, an onion, and a small piece of goat cheese to stab onto your fork along with the beets. More goat cheese and walnuts, I say! Especially for a $13 salad. Then came the appetizer to end all appetizers. It was a special for the evening, and SPECIAL it was! 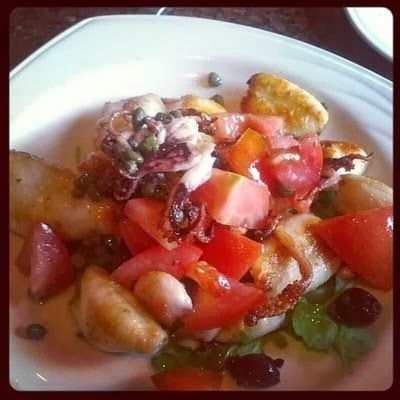 The Grilled Calamari and Squid appetizer hit the nail on the head. The char on the [extra-large] calamari pieces really set the tone for the whole dish. It was served on a bed of perfectly dressed arugula with fresh chopped tomatoes and capers. Once you get a mix of the perfectly-grilled calamari and the salty, briny capers, your life will change and you will never want to fry your calamari again. After the seafood on the plate was gone, I stole the dish from my dad and polished off the arugula, tomatoes, and capers with a nice piece of bread. Mmm, mm! For our entrees, Andrea, Kevin, and my mom all got pasta. Truthfully, I couldn't tell the difference between any of the dishes, except that Kevin's dish had a bunch of shrimp and sun-dried tomatoes in it. I know this, because he diligently picked around all the sun-drieds, careful to not eat one at all. All of the base-sauces looked about the same -- a rich tomato sauce that was hit with a touch of cream to make it the perfect shade of pink. I tasted my mom's pasta - it was great! Just the right amount of parmesan cheese and fresh herbs and the pasta was cooked exactly al dente. I opted for the Veal Milanese, which was a breaded veal chop that could have been cooked a bit more crispy, topped with arugula, artichokes, and chopped tomatoes. My dad also got veal, but his was pan-sauteed with a lemon-butter sauce. Very great dish as well. The only thing that disappointed me was the lack of "side dish" options. My meal was simply a veal chop with the toppings. I would have loved to have been given the choice of a potato or side of linguini. Especially for the price. All-in-all, Radicchio is wonderful. 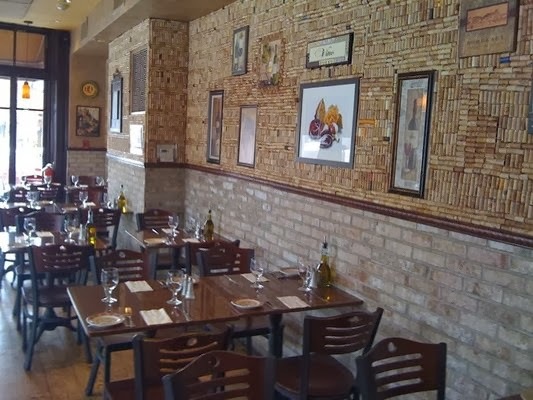 I thought the staff was very attentive, most of the food was outstanding, and its charm is intoxicating. The menu is quite small, and pretty pricey for the actual amount of food you get, but when the food tastes as good as it does there, you shouldn't mind forking over the money. Pun intended.